This Logix 17pc Tool Set is made to get the job done. Designed with quality metal and durable plastic. Includes: 10 inch Curved Locking Pliers, 8 inch Adjustable Wrench, Magnetic Pickup Tool, 7 inch Linesman Pliers, Mini Magnetic Screwdriver Handle and 12pc 1 inch Screwdriver Bit Driver. The Husky 65-Piece Mechanics Tool Set is a great starter kit for the home DIYer and mechanic. 39 different standard and deep sockets allow you to tackle a range of general fastening or repair projects, a must-have for your home workshop. Their rugged, chrome-finished steel construction offers exceptional strength and is backed by Husky's lifetime warranty for peace of mind. The tool set includes a 3/8 in. teardrop ratchet, 39 sockets, an extension bar, an adapter, a magnetic bit holder, 10 screwdriver bits, and 12 nut driver bits. The case included has a dedicated home for nearly every tool and is convenient storage. Sockets with chamfered lead-in are quickly and easily placed onto fasteners. The 16-Piece Microdrive Set features durable construction from alloy steel for strength and long-lasting performance. The finish provides resistance to corrosion. The hex drive head has a thin profile to fit into tight and hard-to-reach places, so you need minimal space in order to turn a fastener. 11-Piece 1/4 in. and 3/8 in. drive standard torx bit set includes Torx bits that feature chrome vanadium steel construction for long-lasting performance. The finish provides resistance to corrosion. The chamfered lead-in on the drive end is for quick and easy placement onto fasteners. 17 pc Tool Set This Logix 17pc Tool Set is made to get the job done. Designed with quality metal and durable plastic. 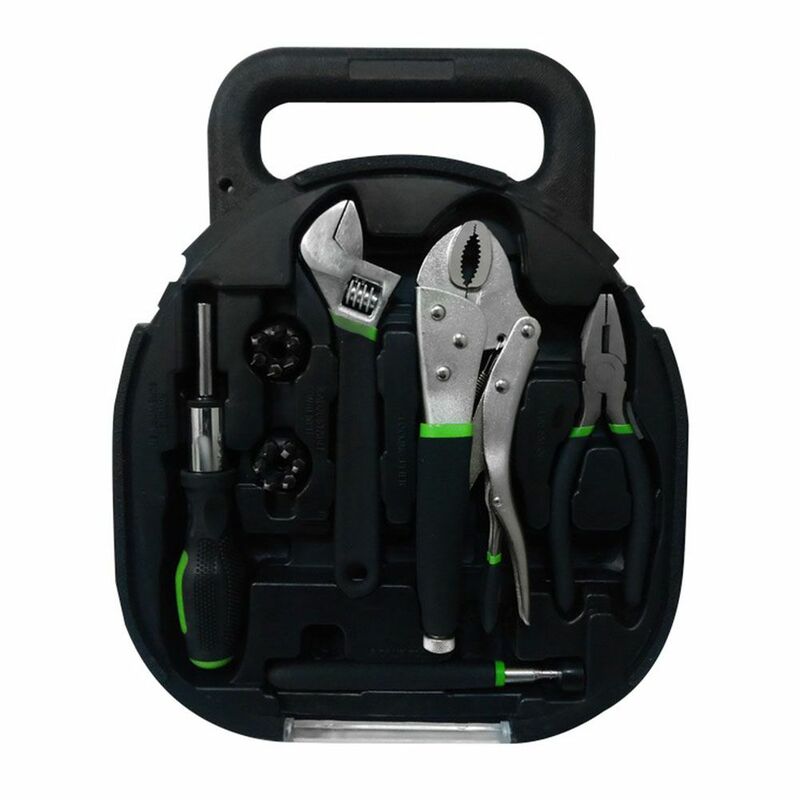 Includes: 10 inch Curved Locking Pliers, 8 inch Adjustable Wrench, Magnetic Pickup Tool, 7 inch Linesman Pliers, Mini Magnetic Screwdriver Handle and 12pc 1 inch Screwdriver Bit Driver.